IAMQC Peer is an innovative, real-time, Peer Comparison Software. Technopath’s web based system facilitates laboratories testing the same lot number of control material to access valuable information from their colleagues through peer comparison. The reports that are generated in IAMQC Peer compare the accuracy and precision of analytical processes between laboratories and peer groups. This information can be extremely valuable, indicating the user’s performance relative to their peer group and also providing powerful troubleshooting tools when attempting to resolve potential problems. 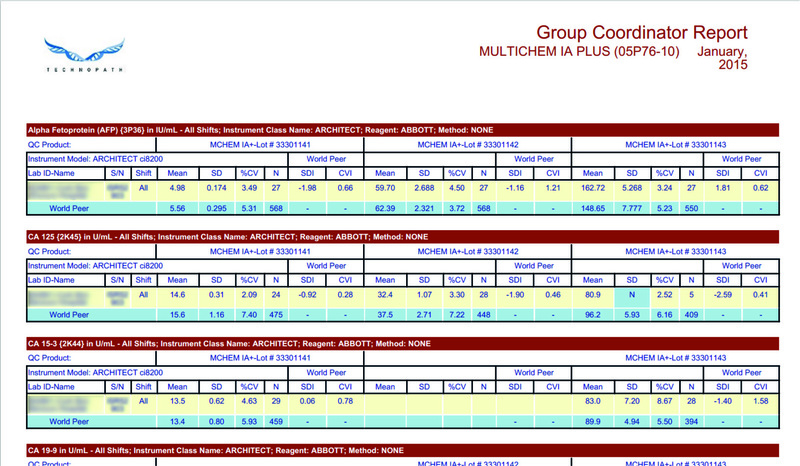 Each one of the IAMQC Peer comparison reports are generated in PDF format and are available on the web. These reports can be generated by the user or automatically on a user defined schedule and emailed to specific recipients. To participate in IAMQC Peer, each individual laboratory submits their individual results or summary statistics (mean, standard deviation, and number of data points) to the central database maintained by Technopath. Laboratories data may be submitted manually on-line or, alternatively, captured by one of our many live interfacing options. The information provided by IAMQC Peer can be used on a monthly basis to evaluate how well lab’s methods are operating, relative to the overall peer group. Users can also look at this peer data in real-time, interactive, tables online, when they are investigating a potential problem with accuracy or precision for an individual method. IAMQC Peer has added new features that will add significant value for the end user. Customers can now generate a Measurement of Uncertainty report in MS Excel format from their online IAMQC Peer account. Measurement of Uncertainty has become an important consideration in many laboratories and is referred to by many of the accreditation bodies as a requirement during audits. The new interactive report includes a normalised method decision chart displaying all assays, a Sigma Metric summary table outlining the calculated sigma score for each assay and a detailed summary table displaying further information on the statistics used for the calculation. This report provides a test by test listing of statistics for the lab and its peer groups for up to 3 levels of control material. A peer group is a group of labs using the same control material and the same analytical method. The Group Coordinator Report documents all of the relevant data points submitted to IAMQC and automatically provides a statistical analysis in table format. This report provides a centralised review of all instruments, from the moment the customer begins to report data and thus facilitates users meeting accreditation requirements, with respect to the storage, retrieval and statistical analysis of quality control data. 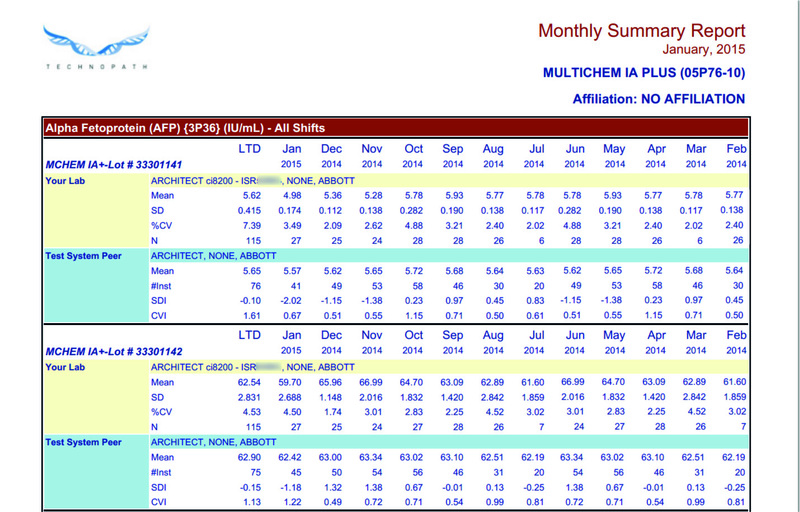 The Levey Jennings Report displays individual daily QC means for the selected month for a specific analyte. The report can be generated for two or three levels of QC material. This report also provides a super-imposed version of all QC levels at the bottom of each sheet, highlighting any level specific bias. 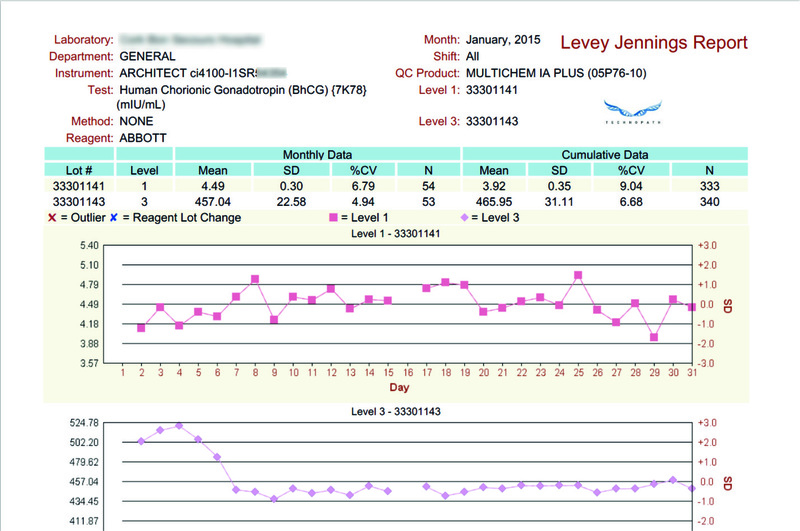 The top of the graph displays a summary of both monthly and cumulative data, including all of the relevant statistics for the laboratory. For each test, and control level, this report displays summary statistics for the last twelve individual months and Lot-to-Date period for the laboratory and its peer groups. This data is useful for long-term intra-laboratory and inter-laboratory comparisons. This report provides the customer with an indication of the ‘usual’ method accuracy and precision, allowing them to view any unexpected trending or increases in imprecision. The report also displays the customer’s monthly SDI and CVI, indicating any shifts from the peer group. The ‘monthly summary’ report facilitates the user investigating changes in performance over time. This report summarizes the laboratory’s tests and analytical methods which differ in performance from its peer group using SDI, CVI and Total Error performance criteria. 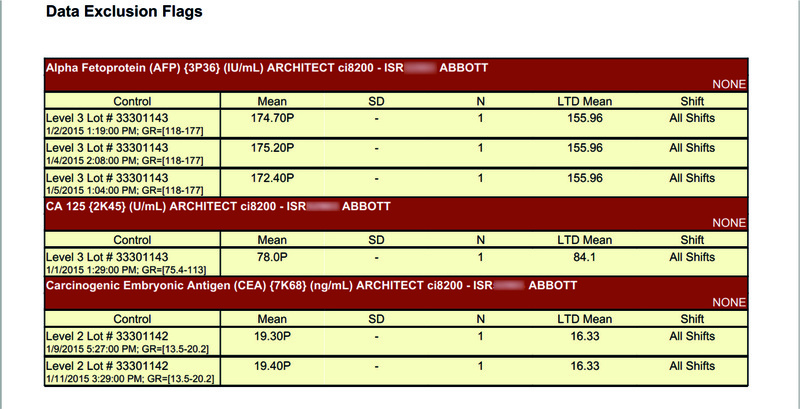 If a specific assay does not meet specific performance criteria the information is highlighted to the user as an exception. Flag L - This value did not pass the Laboratory Outlier check, which highlights values more than+/- 3 standard deviations from the lab’s mean for the month. This value was included in the calculation of the lab’s mean and SD for this month. Flag P - This value did not pass the Peer Outlier Check, which highlights values more than +/- 3 standard deviations from the peer’s mean for the month. This value was included in the calculation of the peer’s mean and SD for this month. Flag G - This value did not pass the Gross Outlier Check, which excludes extremely discrepant data that falls outside of present limits for each test. This data was not processed and is not included in IAMQC Reports and was excluded from the calculation of the peer stats. 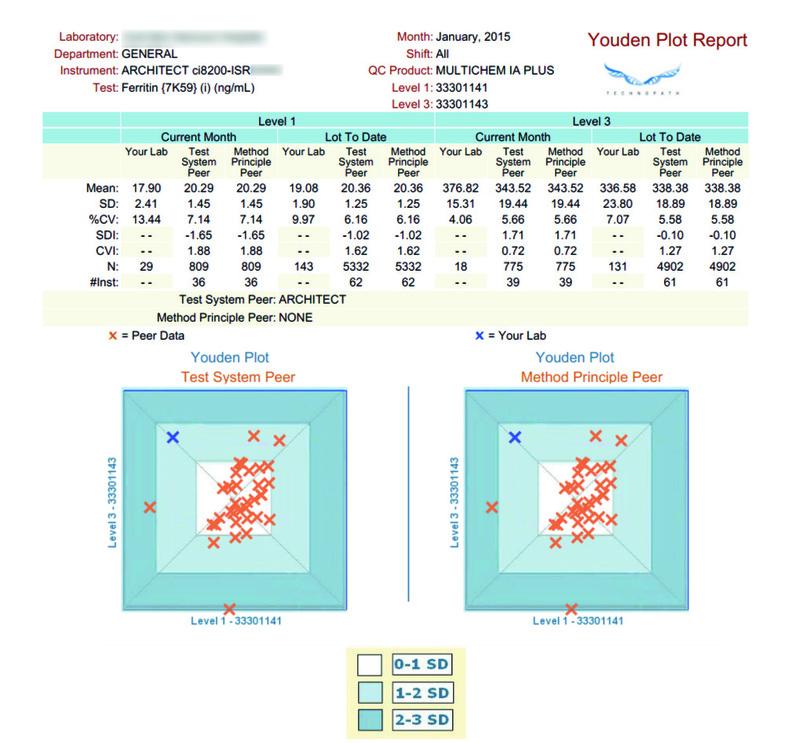 The Youden Report describes internal laboratory performance against the test system peer and method principle peer using the Youden Plot design. Laboratory data is tabularised at the top of the page by individual analyte. The lower half of the page provides a laboratory vs. peer comparison in the form of a Youden plot. The centre of each Youden plot represents the mean of the associated peer group. It is appropriate to assume that each laboratory has its own systematic error. A user that has good precision could unknowingly have an error within their laboratory that is operating to displace their results from the values achieved by the rest of the peer group. The Youden plot visualizes both bias and imprecision and can be used to evaluate systematic and / or random error. 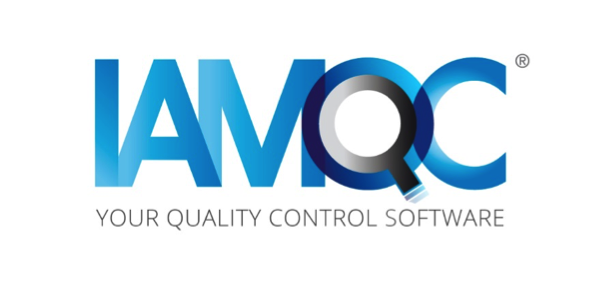 For more information on ordering IAMQC Peer or to request a demo, please contact iamqcsupport@technopathcd.com.